When you are preparing to take care of a baby you can be quickly struck with the overwhelming feeling that you need to know everything about everything. That is a lot of pressure to have on a person. There is a lot of information out there, and it is very easy to become overwhelmed. Therefore, we have complied a one stop source for all of the information you need about one of the most common techniques used when taking care of a newborn: swaddling. Swaddling is the practice of wrapping a child tightly in a blanket in order to both sooth them and help them sleep by restricting their movement. It is by no means a new practice. It has been practiced by cultures across the globe for literally thousands of years. Just like everything else out there, swaddling has its positives and its negatives. The first step, however, is understanding it. There are many things to know about swaddling such as how to do it properly, the pros, and the cons. Swaddling a baby is not a difficult technique. First, you need a blanket, usually a thin one, to wrap your baby in. The blanket should not be too big, but it will still need to be large enough to give you plenty of material to wrap baby properly. You can by swaddling blankets specifically for this purpose. Lay the blanket out on a safe surface so that it looks like a diamond. Take the top corner of the diamond and fold it down into the center. The edge created by this folded corner is where your baby’s neck will rest. Lay your baby face up with this edge just behind baby’s neck where it meets the shoulders. Next, with your baby lying down on the blanket, gently place one of your child’s arms against his or her side. Whichever arm you move is the side of the blanket that is being folded over. Fold that side of the blanket over the baby, tucking the side under the opposite side of the body. Then, turn your attention to the bottom corner of the diamond. Take this corner and tuck it up by your baby’s shoulder on the same side that you just tucked the other corner. Be sure to not pull this part too tight, as you do not want to put strain on the baby’s hips. Finally, put baby’s other arm carefully to his or her side and pull the last corner of the blanket across his or her body and tuck it on the other side. There are reasons that baby swaddling has fallen in and out of favor over time. For one thing, many people see swaddling as less of a soothing method and more of a method of restriction. When a baby squirms and fusses when they try to be swaddled, many critics of swaddling see continuing to swaddle the baby as a means of unwanted restriction. So, if your baby is greatly resisting being swaddled, it is probably best not to swaddle them. Every baby is different, and if yours is showing signs of stress when you attempt to swaddle him or her, they may not find the action comforting and may feel more comfort by having their arms and legs free. However, it is important to note that many of the cons of swaddling a baby stem from swaddling them incorrectly. For example, if a child is swaddled too tightly, especially around the legs and hips, it can be very problematic. If swaddled too tightly, or if too thick a blanket is used when baby is also wearing a full set of warm clothing, they run the risk of overheating at some point during the night. Therefore, if you choose to swaddle your baby, make sure that you know that you can wrap them confidently and firmly, but without being too tight. Also make sure you do not overdress them. Another potential health risk that comes from swaddling a child is an increased risk of hip dysplasia. Studies have been showed that infants who are swaddled are more likely to develop hip dysplasia than those who are not. However, this has to do a lot with how tightly the baby is wrapped and how resistant they are to it. Swaddling is meant to be very soothing, and, for most babies, it is. This is especially true of newborns, who not long before were used to the very warm and confining space of their mother’s womb. For most newborns, being swaddled is at least one familiar sensation in this new strange world they have suddenly burst into. With these more womblike conditions, it is very likely that your child will get a much better night’s sleep than if left un-swaddled. This means, in turn, that you will also be getting a better night’s sleep. They will also be safer in the bed that they are sleeping in, because there will be less risk that they will move around in the night. Furthermore, they will not be able to accidentally scratch themselves, which is just an added bonus. Swaddling your baby goes a long way in keeping your baby safe and helping them sleep soundly at night. When combined with the right baby bed, such as a co-sleeper cot, which keeps baby close by your side and within arms’ reach, you are your new bundle are both guaranteed a good night’s rest and great start to healthy sleeping habits. 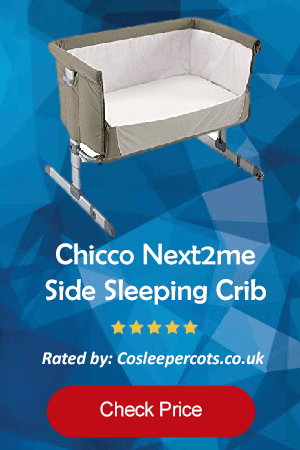 For more information on co-sleeper cots and advice on best sleeping habits and materials, check out our CoSleeper Cots review and blog site!